This article is a write-up of the Swiss Cyber Storm CarGame Challenge 4 (February 2011). For more info on the Swiss Cyber Storm Conference please check my post about the conference here. I submitted my solution and it was accepted by the organisation, however I do not know if this was the solution the organisation expected and if any other participants have other solutions. You have a valid, unprivileged AD user in this wargame. NOTE: You might be logged off in case other users use the same user name. Gain Enterprise Domain Admin Privileges on the provided Microsoft Active Directory infrastructure. Proof you were there. Write your hack verbose journal and attach it to your solution submission. After performing a NMAP scan on the csl-ad.compa.ny host it shows that the system has quite some open ports. The output of the NMAP scan is shown below. 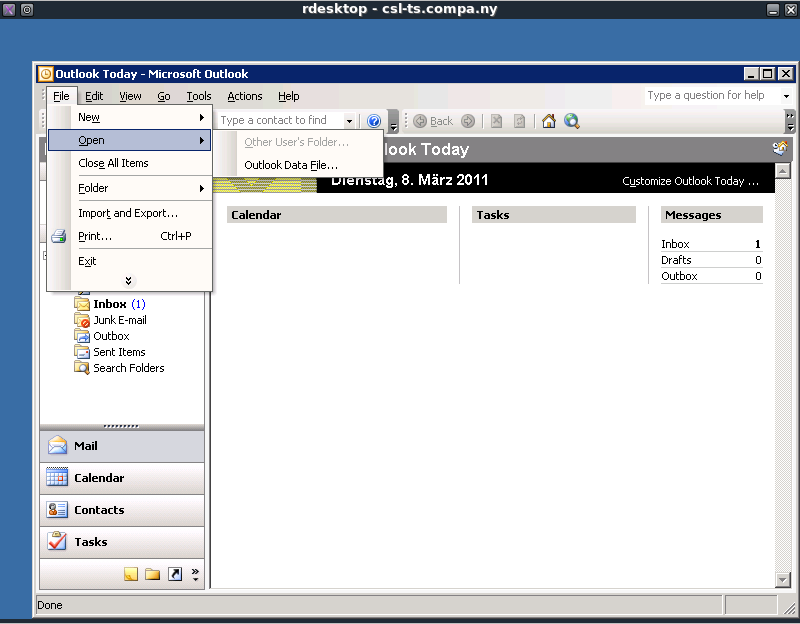 One of the open ports on the system is the RDP (Remote Desktop Protocol) port, when connecting to this port by using the Linux rdesktop program we can see that the server is running Microsoft Windows 2003. The exploit for this vulnerability can be found and executed using the Metasploit framework, the specific Metasploit module (windows/dcerpc/ms07_029_msdns_zonename) and its options can be seen below. After setting all the options in the module the exploit is ready to be executed. The output of this exploit is shown below. The exploit against csl-ad.compa.ny was successful and launched a remote shell (using the payload windows/shell/bind_tcp). Using the ipconfig command we can see that we are indeed on csl-ad.compa.ny (which uses IP 192.168.200.64) and using the whoami command we can see we currently are logged in with the user system. The output of these commands is shown below. Since we are the system user we can use our privileges to create a new local admin account, the commands and output used for that can be shown below. C:\WINDOWS\system32&gt;net user hawkje password /add /domain net user hawkje password /add /domain The command completed successfully. C:\WINDOWS\system32&gt;net localgroup Administrators /add hawkje net localgroup Administrators /add hawkje The command completed successfully. We now have a local admin user which we can use to remotely log in to the system, to do this we use the Linux program rdesktop. The login and password that we will use are of the account we just created. The screenshot below shows us being logged in as user ‘hawkje’ which has admin privileges. These admin privileges can be checked by using the net localgroup administrators command. When opening the Active Directory settings we can find our account between the users. Here we can easily add our account to the Domain Admins group. The membership properties screen can be seen below. Besides the previously used windows/dcerpc/ms07_029_msdns_zonename Metasploit module the same vulnerability (MS09-27) can also be exploited by using an alternative exploit. This alternative exploit is the Metasploit module windows/smb/ms07_029_msdns_zonename, the configuration and the output of this module can be seen below. The csl-ts.compa.ny system does not need to be exploited to gain administrator access to the csl-ad.compa.ny system, and thus could be seen as being out of scope for this challenge. However, since the system is part of this exercise I decided to exploit it as well, in a totally different way than the csl-ad.compa.ny system. As part of the challenge we received a set of user accounts. These user accounts can be used to log in to the csl-ts.compa.ny terminal server. The user account that will be used is the account hacker14 with password compass. To connect to the csl-ts.compa.ny server we will use the Linux rdesktop program, the command to start this program is shown below and it will open a RDP session to the system. When the RDP session is opened on the csl-ts.compa.ny system we notice that we are not getting a normal Windows session, we only get a session with Outlook 2003. This means that we should break out of this Outlook 2003 session. This action is shown on the screenshot below. In the “Open Outlook Data File” dialog screen we can browse to the Windows directory (C:\Windows\) and when we select “All Files (*. *)” as “Files of type:”, explorer.exe will show up. When we right click explorer.exe we can choose “Open” to execute it. After executing explorer.exe a script can be seen that will pop up, this script can be found in the start menu as shown in the next screenshot. The script seems to run the lsrunase.exe program and uses the runbatch account to do so. 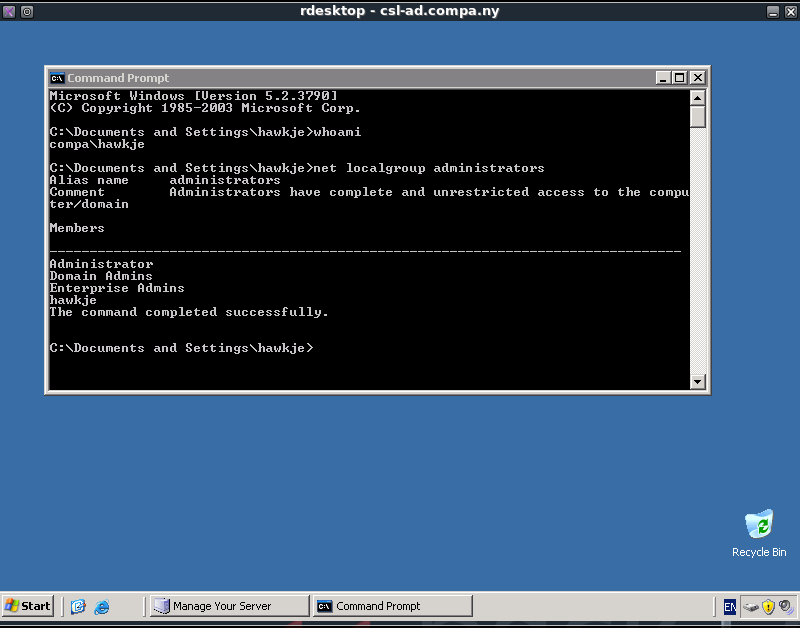 This runbatch account is part of the local administrators group as can be seen below after executing the net localgroup administrators command. C:\Documents and Settings\hacker14&gt;net localgroup administrators Alias name administrators Comment Administrators have complete and unrestricted access to the computer/domain Members ------------------------------------------------------------------------------- Administrator COMPA\Domain Admins hackmin ibuetler runbatch stefan The command completed successfully. The command in the init_script.bat file can easily be adjusted to execute other commands, which means we can execute commands as the runbatch user. 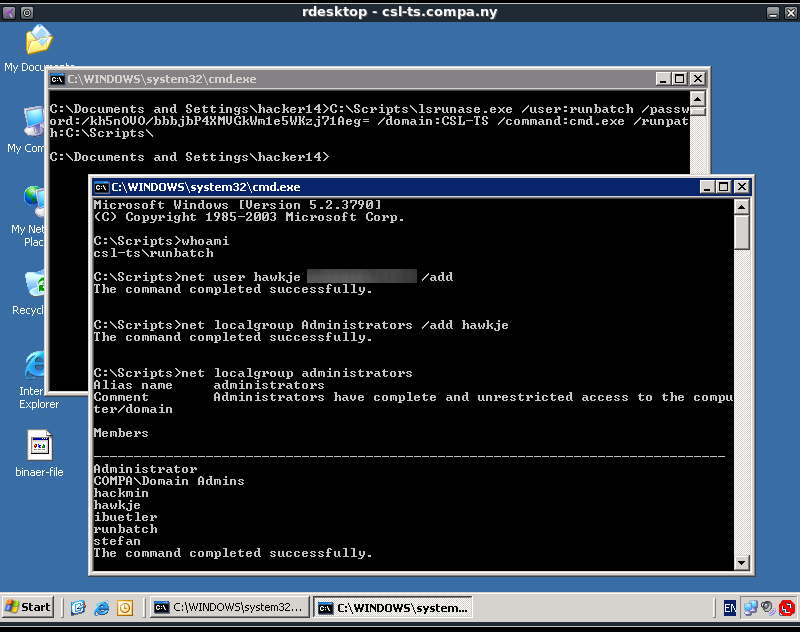 Since the runbatch user is a local admin account we can execute commands as a local admin. The easiest command to execute is cmd.exe to get access to a local admin command shell. The cmd.exe command can be executed with the following adjustment to the init_script.bat. After executing this command from a cmd.exe command shell a new command shell will open with the runbatch (and thus local admin) rights. This command shell can then be abused to add a new local admin user. These actions can be seen in the screenshot below. Install the latest software and security updates from Microsoft. Activate a firewall on both of the systems or place both systems behind a hardware firewall. 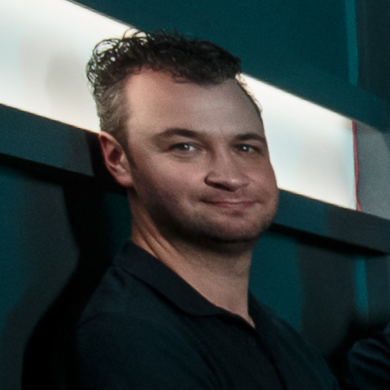 The firewall should block all traffic except the traffic that is needed for operational use, only traffic from legitimate systems should be allowed. Install and maintain an Antivirus solution. Disable and remove the init_script.bat script running on the csl-ts.compa.ny system. 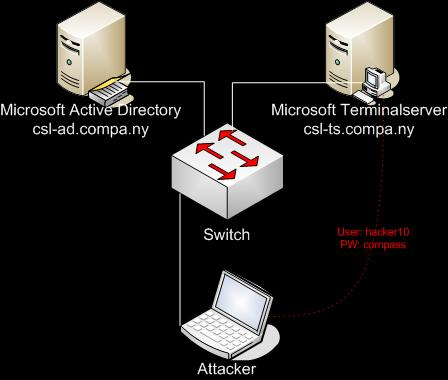 Disable the execution of explorer.exe on the csl-ts.compa.ny system. Or enable Outlook Web Access (OWA) instead of the current Outlook 2003 sessions. Remove any unnecessary data from the systems, including the currently present old password dump files and exploit files.